Russia Builds Four New Air Bases in Syria, Deploys Another 6,000 Troops – Coercion Code – "Dark Times are upon us"
Contrary to Moscow’s promises, the Russian military is not pulling out of Syria, but adding four more air bases (one shared with Iran) and 6,000 more troops. As reported in an Israel Report at the time, on December 11, 2017, Russian President Vladimir Putin, followed by Defence Minister Sergey Shoigu, announced that the Russian military was to withdraw from Syria to home bases. Reliable military and intelligence sources report that now the reverse happened. A small number of units were indeed sent home, but they were soon replaced, and instead of two bases – the air facility at Hmeimim and the naval installation at Tartus – four more Syrian air bases are being reconstructed and adapted for the use of the Russian air force. 1] The Tiyas Military Airbase (also known as T-4) in the Homs Governorate west of Palmyra, is the largest in Syria. The Russians are massively converting it into their main centre of aerial operations in central Syria. Tyas will also provide backup as needed for Khmeimim, if drone, missile and mortar attacks recur. 2] Palmyra (or Tadmor) Airport provides air support for operations in eastern Syria including the Deir ez-Zour province. Moscow has agreed to share it with Iran. The Revolutionary Guards Al Qods chief Gen. Qassem Soleimani is planning to make Palmyra the main assembly centre for the transfer of pro-Iranian Iraqi Shiite militias from southern Iraq to Syria. 3] From Hama Military Airport west of Hama, the Russians will exercise control from the air of central Syria and the northern and central highways to Damascus. Still more importantly, this airport’s location places it just 125km as the crow flies (173km by road) from Russia’s Tartus naval base on the Mediterranean coast. 4] Shayrat, at Homs (which became notorious as the target of a massive US Tomahawk attack last year) is the main landing site for air transports which bring the Russian and Iranian forces troop reinforcements,weapons and spare parts. More than 6,000 additional Russian military personnel are assigned to the four renovated bases in Syria – most of them air force and special operations personnel. 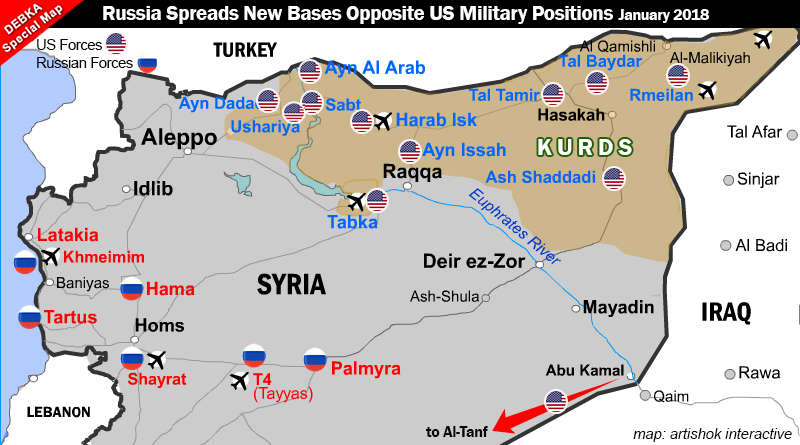 The two powers are evidently in a race for bases in Syria. In strategic terms, the two powers are dividing a large swathe of Syria between them as regions of influence, leaving any future ruler in Damascus with just about half of Syrian territory under government control. It is imperative to keep uppermost in mind that Netanyahu has stridently stated that Israel will not allow a permanent Iranian precesence in Syria. [See Israel Report 31 January 2018]. Can anyone say Isaiah 17? Meanwhile, Trump has approved temporary U.S. residency for 6,900 Syrians. Nearly 7,000 Syrians living in the U.S. were granted temporary protection from deportation for another 18 months under the humanitarian program, Temporary Protected Status (TPS). It does not apply to new or recent applicants from Syria after August 2016. Syria is turning out to be prophetically fascinating in a very dangerous sort of way?